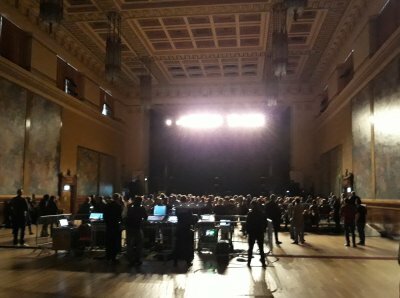 The last time I was in the Brangwyn Hall was almost 30 years ago at my graduation. It’s a beautiful space, home to artist Frank Brangwyn’s British Empire Panels, commissioned for the House of Lords in 1924 to commemorate the First World War, but ultimately rejected for being ‘too colourful’ and re-homed in Swansea’s newly built Guildhall, of which the Brangwyn is part, in 1934. Many attendees are admiring the panels before the show, and taking in the room for the first time in so long, I felt quite uplifted. It’s a great space for shows such as this, and a perfect fit for Public Service Broadcasting; full of history, epic in scale and with a resonance that you can feel in your soul, and with PSB’s latest album, Every Valley, recalling the rise and fall of the nearby South Wales coal field between the 1950s and 1980s, for which Swansea Docks was an important export point, it’s sure to be an emotional evening. But first Jane Weaver and her band. 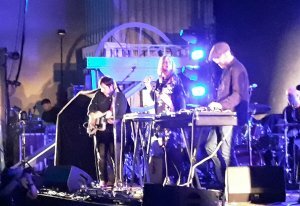 A name I am not familiar with, but Jane has a lovely voice and it’s an engaging set of sophisticated cosmic pop, edged with elements of New Wave. 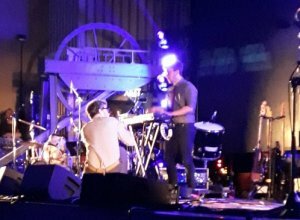 The band of guitar, drums and synthesizer driven rhythms are tight, if lacking much in the way of dynamics, crammed together as they are in the centre of the packed stage. The songs, largely from her third album, Modern Kosmology, are up to date but the ’80s feel that many possess gives them a nostalgic aura and the audience, predominantly 30s-40s by the look of it, lap it up. Despite some of the keyboard lines being rather cheesy, it’s an enjoyable 40 minutes or so, very different to the main act but warms the crowd up nicely. Public Service Broadcasting‘s avowed intent to “inform, educate and entertain audiences around the globe” has drawn a large crowd to drink in the spectacle at that rarest of things, an interesting gig in Swansea, and after a brief interval the lights dim for a light-hearted yet pointed message regarding mobile phone use and the affect it has on those around you, which certainly has the backing of most of the crowd. PSB appear to cheers and it is immediately obvious that this isn’t going to be any run-of-the-mill show. With the stage flanked by coal mine winding wheels and miners’ lamps descending from the ceiling, they open with the first three tracks from Every Valley and we are quickly immersed in the heyday of the mining industry as footage from the archive of the NCB Film Unit plays out on the two screens behind the stage, accompanied by the distinctive voices of Donald Houston and Richard Burton. The overriding concept of Every Valley is of industrial decay and can therefore be linked to many industries around the world, but more importantly than that it highlights the social history of communities shattered and brought down by the vagaries of economics and greed. As someone who grew up with family in the Valleys, each childhood trip there was like a descent into a netherworld of darkness; the towering black coal tips, all since reclaimed, were still in situ, an ominous landscape built by the labours of countless miners deep under the ground. But what I remember most as a child was the sense of community and the bustling towns, as shown in the images on the screens. There was work for everyone, a community of associated trades and businesses to support the whole population and a sense of invincibility. And then the decline. It’s a very different place now. The way in which PSB weave public information films, archive footage, eye-witness accounts and propaganda material into their live performances is mesmerising. 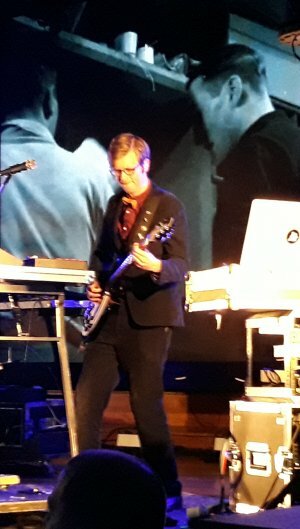 You can spend the whole show just watching the screens as the selections are fascinating, and the topics they choose to cover have a wealth of footage available, bringing the show to life, to Inform – Educate – Entertain, and it’s to that first album that we go for a banjo inflected Theme from PSB and Night Mail, accompanied by W.H. Auden’s classic poem and clips from the 1936 mail train documentary of the same name. Then we’re off into The Race For Space with tracks commemorating Soviet rocket engineer Sergei Korolev and first woman in space Valentina Tereshkova. If music ever inspired you to further reading around the chosen subject matter then PSB are for you. 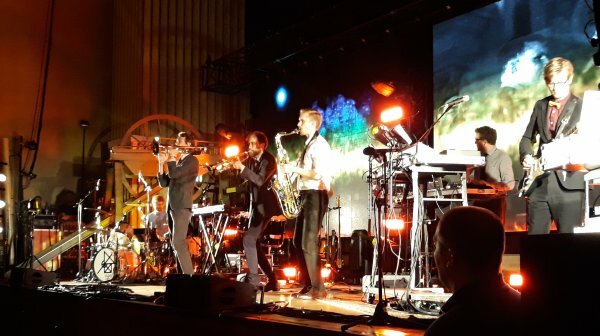 Throughout the set the three piece brass section play a key role, whether colouring the material from the back of the stage or becoming the focal point at the front, their performance is spot on and a vital part of the show. 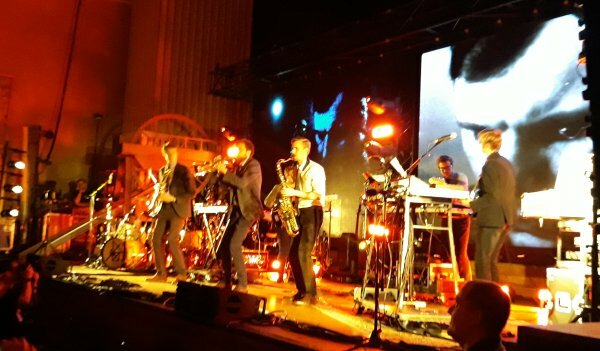 Another important component of the PSB live set up is Mr.B, handing the visual presentation and prowling the stage live feeding images of the band performance to the screens. It’s back to Every Valley as things take a turn for the worse for the mining industry with Progress. The band are joined by Haiku Salut to add their beautiful voices and accordion to They Gave Me a Lamp, while J.Willgoose Esq. touchingly duets with Lisa Jên Brown on You + Me. Willgoose thanks the South Wales Miners’ Library for their assistance in putting Every Valley together before a heartfelt Mother of the Village, with more testimonies from some of those who lived through those times. The set cruises to a close with a quite brilliant trio of tracks, spitfire, supported by images of Leslie Howard from the 1942 R.J. Mitchell biopic The First of the Few, The Other Side which spookily recreates Apollo 8’s 1968 journey around the dark side of the Moon, and the uptempo Go! as Apollo 11 is cleared for descent to the Moon’s surface. It’s exhilarating stuff and PSB pull it off superbly. The inevitable encore starts with the near-metal of a scathing All Out as the Miners’ Strike and the Battle of Orgreave plays out on the screens, juxtaposing with the funk of Gagarin where the band are joined by dancing cosmonauts, and finally Everest as Edmund Hillary and Tenzing Norgay head for the summit. It’s a suitably epic way to close and the crowd go mental. 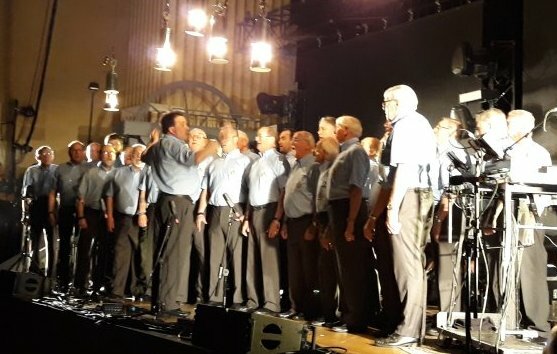 Willgoose thanks everyone, but announces that there is one more item, the band leaving the stage to the Beaufort Male Voice Choir for a beautiful run through of Take Me Home, the cheers at the end almost raising the roof. It’s been a great show; the sound has been excellent, the audience captivated throughout and the performances second to none. As a previous casually interested onlooker to all things PSB, I am now a huge fan. Anyone with an interest in compelling instrumental music or just history in general should see them whenever the opportunity arises, I can guarantee that you will certainly be informed, educated and entertained.